I've got a problem with one of the gain knobs and both of the bass knobs on my Rane TTM56 DJ mixer. They've been used quite a bit over the last couple of years and have recently started crackling whenever I adjust them in any way. Usually, if I'm getting bleed or crackle from a fader I'll use some sort of spray lubricant, like WD40, but I'm not sure if this will work with EQ knobs. I've often heard people mention contact cleaner for use with connectors, so I assume this kind of thing could work for my pots? Has anyone had similar problems, and if so could you offer any advice? Caig's Deoxit D5 is a contact enhancer that's an excellent choice for cleaning connectors, as it improves conductivity and — unlike many other lubricants — doesn't leave a sticky film. Deoxit can also be used on crackly pots, and while it won't actually restore them to full health it could buy you some time while you look for a replacement pot. Editor In Chief Paul White replies: We get a number of enquiries as to the best way to clean faulty socket contacts or crackly pots, and there are many commercial contact cleaners available. However, you should be aware that most ordinary contact cleaners have a greasy base and tend to leave an oily film on the surface being treated. So, although you may notice an improvement in the short term, you often find that dust builds up on the sticky surface and may eventually make the problem even worse than before. Most connector contacts can be cleaned to some extent by repeatedly inserting and removing the connector (Studiospares market an abrasive dummy jack plug that does the job more effectively), although the normalising contacts found in patchbay and insert point TRS jacks aren't in direct contact with the plug, so they don't tend to respond to this treatment. 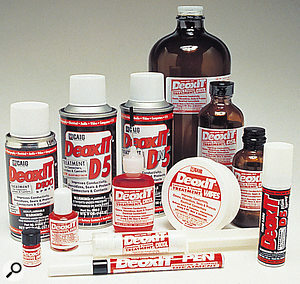 My preferred treatment for awkward connectors is to use Caig's Deoxit D5 spray, a contact enhancer that reacts with the metal surfaces of the connectors to improve conductivity, but without leaving a sticky film. You can also use it, sprayed onto a cloth, to wipe jack plugs clean as part of your routine maintenance. Avoid getting it near the capsules or internal electronics of capacitor mics, though, as it can compromise the operation of the extremely high impedance circuitry used there. Almost every large music store in the US stocks Deoxit, but in the UK you may have to order it from a studio supply company or track it down on the Internet. Compressed air can sometimes remove dust that may be causing a pot to be crackly. However, the problem may not be dust: most pots have a carbon-based resistive track, and the action of the metal wiper contact eventually wears away some of the carbon, which can also generate crackling. If you use a cleaner/lubricant spray on a badly worn pot this carbon can mix with it, to create a greasy carbon-dust sludge. In the long term, replacing the pot is your best option, but a spray of Deoxit D5, or even off-the-shelf contact cleaner, may buy you some time. You need to be able to get to the back of the pot and spray into it where the three contact lugs exit the casing, so the flexible tube that comes with these sprays is useful here. Don't try to spray the top of the pot, hoping some will run down the shaft and into the mechanism, because that part of any pot is pretty well sealed. Finally, a lot of dust-related problems can be avoided by covering mixing consoles and patchbays with cloths when not in use.